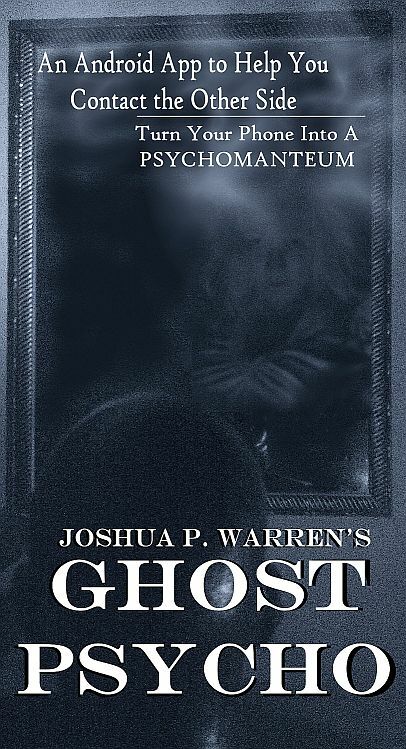 Joshua P. Warren presents this first-ever psychomanteum app. It is used to help you see real ghosts, or experience other real paranormal phenomena. It is based on a technique pioneered 1000s of years ago in Greece, and modernized in the 20th century. It's very simple to use. First, adjust your phone settings so that your screen does not shut off. Next, activate the Ghost Psycho screen. The black section works like a dimly-lit black mirror, with white noise playing in the background. Think deeply about the paranormal experience you want to have. Then go by yourself into an absolutely dark, quiet room. Sit in a comfortable chair, and place your phone in front of you (preferably a bit above eye-level). Hit the play button to start the white noise. You can also loop the audio indefinitely by hitting the loop button to the right of the track. Just relax and keep your eyes on the black part of the screen. It's okay to blink, but don't look away. After a few minutes, you will begin to see strange things in the room. The longer you stay, the more you will experience. Some spend hours during one session. No one knows exactly how or why this simple technique works. It's different for everyone, but it is often used as a tool for grief counseling or paranormal research. To learn more, read the book REUNIONS by Dr. Raymond Moody.